Presenting the complete nail care centre. Take the handheld driver, it is rechargeable so full of oomph rather than the regular nail shapers which rely on battery power. Insert a nail file burr. You have six to choose from; from cone shaped stones to flat buffers. Shape, polish and caress your nails, adjusting between the two speeds as you go. The driver is cordless so can be used on your toenails too. Put on the paint, varnish or glitter, but don`t you smear! 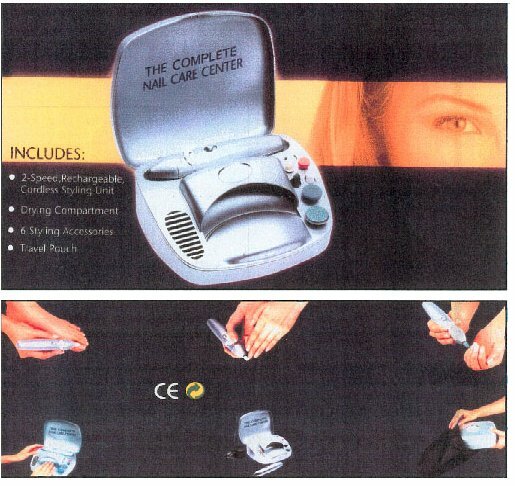 Instead use the dryer on the complete nail care centre home manicure set. Insert your fingers and have the fan gently dry your nails, bliss. When you are done, there is an attractive travel pouch to tuck the complete nail care centre in. Complete Nail Care Centre text, images and video are copyright.